Every destination has a particular dish or ingredient that really stands out to its visitors, and the Bahamas is no exception to this. Conch is an ingredient that has become entirely synonymous with Bahamas food. The tantalizing aromas of conch salad fill the air of markets and bustling public areas throughout the Bahamas, and taking a bite is an absolute must! During your tour of the Bahamas, whether its a day trip or you’re staying several weeks, you will undoubtedly come across conch. This is a Bahamian staple and is used in a number of the best traditional dishes. Conch salad is among the most popular, though there are numerous ways to enjoy this unique meat. Booking a trip with Bahamas Air Tours will guarantee you a chance to try some of these local dishes and give you the chance to explore the oceans from which the conch were collected. You will also find that there are many more uses for conch beyond Bahamas food on your tour. Bahamas conch is a chewy white meat which can best be compared to calamari. It is a juicy, flavorful and chewy ingredient that has become a true Bahamian delicacy. It is certainly worth a try, even if you expect not to enjoy it, you will likely be pleasantly surprised. The meat is found in the shells of molluscs in the Caribbean Sea and has become an exceedingly popular dish because of its endless availability. Food also plays such an immense role in the culture of a destination. To truly immerse yourself in the Bahamian culture will mean exploring a local fish fry and picking up a conch salad and perhaps pairing it with a local Kalik beer. Bahamas food has a very unique flavor to it as well, which means that you will unlikely find an experience quite like this one anywhere else in the world. Of course, you’ll certainly find a great deal more food on offer, seafood and otherwise, but a trip to the Bahamas would not be complete without tasting conch salad or one of the other local delicacies. You could eat conch for a number of days before having tried all the different dishes. Conch is an exceptionally versatile ingredient and you will find that no two dishes are quite the same, aside from the unmistakable flavors and textures of the conch. During your tour of the Bahamas you will have a chance to choose from a number of conch food dishes. Conch Salad is a delicious and refreshing meal, but there is so much more on offer. Conch fritters are an excellent place to start, the flavors are accessible to people of all ages and are almost always served with a dip, which will give you a chance to ease yourself into the dish before trying some of the more distinct conch dishes. Cracked conch is just as good to try first. While it may be called cracked conch, it is essentially deep fried conch. Much like fried calamari, with a delectably crispy exterior and a juicy center, cracked conch is something that absolutely all Bahamian visitors should experience. Naturally you’ll also be sure to find seafood platters on the menu of any restaurant that you visit during your time in the Bahamas. These will almost always include conch in some form or other, and is an excellent way to enjoy this delicious meat. Some vendors even sell raw conch. Whether you choose to cook this yourself or dig into it raw is entirely up to you. 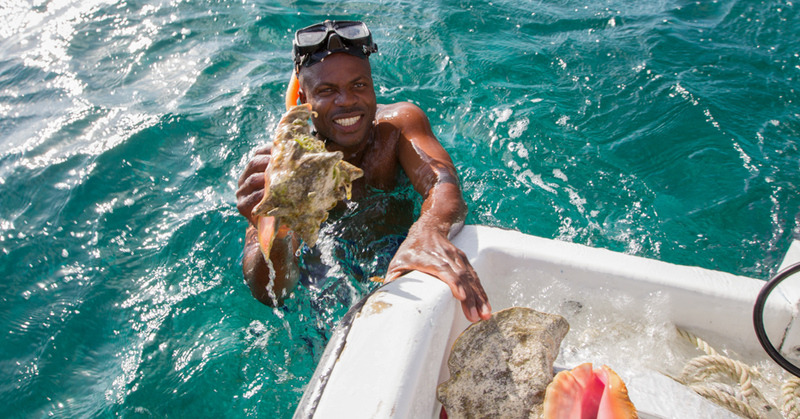 Raw conch is not uncommon in the Bahamas and can actually prove to be very enjoyable. The conch salad recipe is relatively simple and straightforward, but yields absolutely incredible results. Most conch salads are comprised of bell pepper, onion, tomato, raw conch, citrus fruits and local spices. The spices and citrus contrast one another in a way that allows both flavors to stand out, and yet they also blend to a point that neither feels out of place. The delicious juices of the citrus fruit also create the perfect addition to the juicy conch meat. All of this combined with the salsa-like mixture of onion tomato and bell pepper makes for an unforgettable dish. The curious thing about Bahamas conch salad is how it can be used in a number of different ways. While it certainly can be enjoyed as a dish of its own, which is the most popular option, it can also serve as a side dish for another meal. Adding spoonfuls of this delicious, fresh salad to a cooked meal can prove to be a marvellous idea. During a visit with Bahamas Air Tours you will have a chance to try all of these dishes and so much more. Whether you choose to travel on a day trip or a multi-night stay, you’ll be sure to come across conch in almost every new destination. Not only will it help to immerse you into the Bahamian culture, but it will undoubtedly add an exceptional and unique culinary experience to your tour of the Bahamas. Whether you choose conch salad or conch fritters, or any number of other conch dishes, you are sure to not be disappointed. While conch is most commonly used in dishes, it has other uses too. You will find this when visiting local stalls or craft markets around the country. The Bahamian people don’t let a single piece of the conch go to waste, and once the meat has been harvested from the shell, the shells become the center of attention. You will find beautifully crafted and carved conch shell jewelry throughout the Bahamas. Often the shells are carved into pendants for necklaces which prove to be exceptional souvenirs of your time in the Bahamas. Since there are so many craft markets and stalls to choose from, you will be sure to find a pendant that suits you, with many of the vendors even offering custom engraving. These also make exceptional gifts for any friends or family back home. You will also find intricately carved shells that you can place on a windowsill or mantlepiece at home. Some stalls will even sell full conch shells with just a small hole made at the narrow end. These can be blown into and, if done right, will make a beautiful and wavering sound like a horn. Whatever you choose, taking one of these products home with you will be the ideal way to remember your time in the Bahamas and all the delicious meals you enjoyed during your trip. The Bahamas is a destination full of wonder. There will always be something new for you to try, and for many first-time visitors, it will be conch. So whether you dig into a conch salad, place a conch necklace over your head or take home a carved conch shell as a souvenir, conch will undoubtedly be a very big part of your tour. A trip with Bahamas Air Tours guarantees new and exciting experiences. From soaring over the magnificent archipelago to trying local delicacies, you will certainly have the tour of a lifetime.